What better way to start out? We cannot develop good applications without the appropriate tools. A bit like a carpenter doing some wood job without the perfect hammer or pincer. I’m gonna show you 5 awesome applications that will change the way you program and develop. This is without a doubt one of the tools that has helped me the most all these years. Easy to use, lightweight and groups all the features you need while debugging or analyzing a website. I personally use the View Generated Source a lot when I’m developing AJAX supported applications. 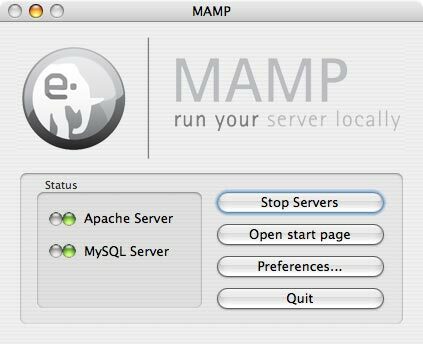 Originally created for Mac OSX (MAMP – Mac Apache MySQL and PHP) this was, for me, the best application I’ve tried. Above all other functionalities it really shines when you need to continue working and you are not able to get an Internet connection (Yes it did happen to me a couple of times), just use MAMP widget, start your servers and access your own server by going to “http://localhost:8888“. WAMP as you probably figured out by now is the same application but this time for Windows. WAMP is not as simples to set up as MAMP, but nether less, it keeps the do-it-simple. I know this one is for Mac OSX only but I cannot go by a not mentioning it. An awesome tool for developing and completely managing you websites projects. Coda has all the fancy tools that any web developer uses on they’re daily basis. Sequel Pro is the perfect tool for quick and easy management of a database (MySQL one). It allows all normal views, Table, Content and SQL, it has SQL code verification and support for various databases. As for windows, from what I’ve seen, there aren’t many applications that can surpass MySQL Administrator. A few months ago I didn’t know about this application, but as soon as I got in contact with it I just started to love it. It’s data modeling made easy and fast. The great thing about this piece of software is the ability to export to SQL, most of the types as supported. There are a lot more good apps and I only chose these ones for they’re utility and easy to use features. Feel free to comment and suggest a few more.